Since the USinternetworking bankruptcy in 2001, there has been a lot of skepticism about the managed hosting business. It squeezes in between the more asset heavy collocation industry, and the more people heavy Software-as-a-Service industry. This requires that managed hosters walk a financial tightrope between wrecking the balance sheet with too many fixed asset purchases, or destroying the income statement by hiring too many people. Before the USinternetworking story ended at chapter 11, there were clear warning signs of trouble with the company that were evident in its asset utilization and employee productivity ratios. It had a .48 Revenue/PP&E ratio, and just $95,000 of revenue per employee. Essentially, it was trying to be capital-intensive and labor-intensive at the same time. In addition to the dot com bust, this sent everyone scrambling away from the managed services market, and left it as a side service for collocation providers and telecom carriers, except for one company that decided to focus on it - Rackspace (RAX). Rackspace has carefully managed both its asset utilization and employee productivity to the point that its EBITDA margins now top 30%, which is remarkable considering how this type of service was once seen as a one-way ticket to bankruptcy court. 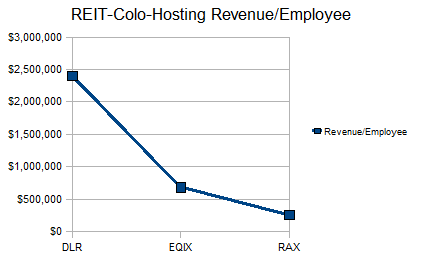 The company's 1.59 Revenue/PP&E ratio is among the highest outside of the REITs and co-lo providers. 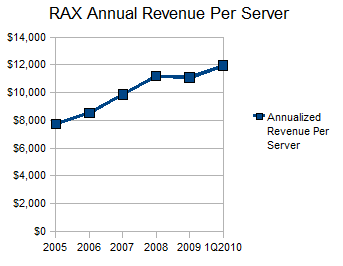 Moreover, its revenue per server has been increasing from $7,700 to 2005 to nearly $12,000 today. 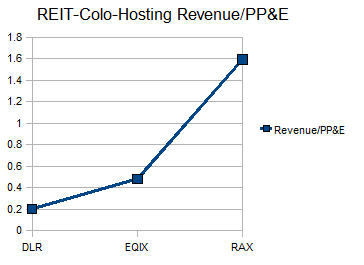 The financial benefits of sticking to managed services for Rackspace have been similar to the financial benefits Equinix (EQIX) has seen from sticking to unmanaged services, and that Digital Realty (DLR) has seen from being a simple REIT. This is best seen in each company's asset and employee utilization ratios, which are vastly different for each. As you can see, the asset and employee utilization numbers for each company differ significantly, which is why these services do not mix well under one corporate entity. Rackspace's cloud service has not resulted in over-diversification for the company, because it runs at similar revenue/employee and revenue/asset ratios to the traditional hosting service, and it allows the company to use idle capacity in existing servers. In addition to stronger balance sheet and income statement ratios, these focused providers have also seen higher revenue growth over the last year, as other competitors sort out which services they do and do not want to offer. Nonetheless, it does not take deep technical knowledge to succeed in this business, just a simple understanding of how to choose between spending on people or spending on assets.